Preventive dentistry is the area of dentistry that focuses on those procedures and life practices that help people to prevent the beginning or progression of oral disease. It includes at-home dental care performed by patients, as well as dental care and education by our professional dental staff, as well as at-home dental care performed by the patient. Preventive dentistry helps patients avoid dental disease or catch it in its early and more treatable stages.. There are several parts to Preventive Dental treatment at our dental office. 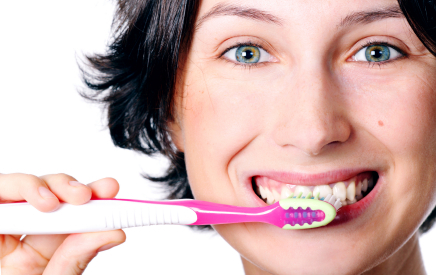 The prophylaxis, or the cleaning of the teeth, removes the accumulations of the calculus and plaque. The oral examination inspects the teeth and soft tissues of the mouth for any abnormalities and potential oral cancer lesions. Periodontal probing is also done during the oral exam to check the health of the patient’s gingiva (gums) and bone. Dental xrays are also an important part of the preventive dental appointment, to check for decay, possible infection and bone loss. We may also prescribe medications or over the counter products to help prevent dental disease, including anti-bacterial rinses, which help prevent periodontal problems and help reduce dry mouth. Preventive procedures such as fluoride or sealants are also performed on children and teens. And we also look for malocclusions in these younger patients, and possibly refer them to an orthodontist. Additionally, we often recommend the fabrication of sports mouth guards to protect the teeth during contact sports. The results of good preventive dental care are healthy teeth and gums throughout one’s life and the early detection of oral disease. Preventive procedures, such as fluoride applications and sealants, can help prevent tooth decay. Regular dental checkups and oral cancer screenings can catch oral cancer at its most treatable stages. Dental checkups and consistent at-home preventive dental care can stave off caries (tooth decay) and periodontal disease, which can lead to tooth loss. To schedule an appointment please call us 248-646-2450 or fill out online form.